Set up a development environment with Apache web server and Joomla! Build stunning photo galleries with Flash animation effects and display photos on your Joomla! web site from a Flickr account using third-party extensions for Joomla! Display Joomla! 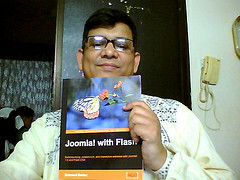 contents in Flash objects using amfPHP and J-AMFPHP extension for Joomla! Improve the overall design and look & feel of the site, with the help of Flash templates and tickers in Joomla!